Insomnia is a common problem in the United States, affecting 5% to 10% of the population. It is defined as difficulty falling or remaining asleep. It can occur for a variety of reasons, and can be very debilitating. Insomnia can be acute (caused by a time-limited stressor, like a big exam or a break-up) or chronic. 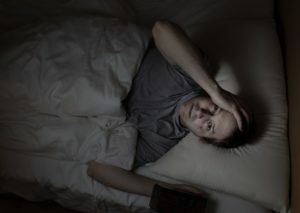 Acute insomnia can become chronic, and should be treated if it does. Insomnia is closely tied to b ehavior. For this reason, cognitive-behavioral therapy is considered a primary treatment option. Sleep medications can be effective to treat some aspects of trouble sleeping, but do not address the cause. For those suffering from poor sleep who would like to use non-medication treatment, cognitive-behavioral therapy (CBT) can be an excellent option. Many people with difficulty falling asleep struggle with anxiety-provoking thought processes that they cannot “shut off” before sleeping. For example, thinking repeatedly about how one won’t be able to fall asleep can, in fact, make it difficult to fall asleep. Another example would be repeated thoughts about how bad it will be tomorrow if one cannot sleep tonight. CBT teaches us how to handle thoughts like this when they arise so that our sleep is less affected, and so that our anxiety remains low. CBT can also provide helpful instruction about how to manage our bedtime routine to maximize our chances of getting the sleep we need.